The son of actor celebrity parents, Eysenck was one of the 20th century’s most controversial and prolific psychologists. Born in Germany, his opposition to the Nazi party during the 1930s led to his fleeing to Britain, where he remained for the rest of his life. At the time of his death in 1997, he was the most-cited researcher in psychology. Many people know the name ‘HJ Eysenck’ from the covers of many popular books on IQ and personality, and it is slightly ironic that this tower of academic strength also wrote titles that could be classed as ‘pop’ psychology. 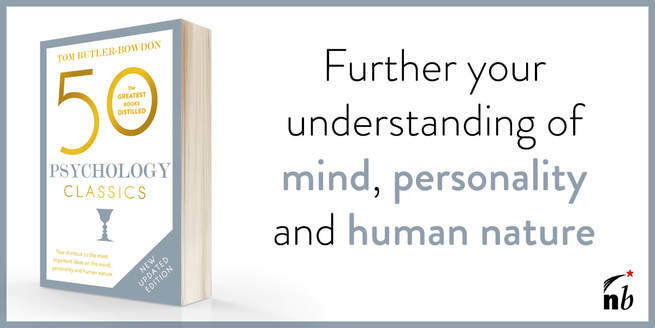 Dimensions of Personality, was Eysenck’s first book, and has a dry, academic style. However, in grounding for the first time the concept of introversion/extraversion in science, it laid the foundation for 50 years work in the field of personality difference. Though Eysenck took his hat off to the ancient Greek division of people into the four temperaments of sanguine, choleric, phlegmatic and melancholy, and was obviously in debt to Carl Jung’s distinction between introverts and extroverts, he was also adamant that any study of personality differences had to be objective and statistically based. Dimensions of Personality was based on a method of research, factor analysis, which enabled Eysenck to draw conclusions about personality differences from large amounts of survey data. He had worked at the Mill Hill Emergency Hospital in wartime London, and used as his sample was several hundred war-weary soldiers. The men were asked a battery of questions about their habitual reactions to certain situations and gave themselves ratings. The collated answers led Eysenck to confidently place a person according to two broad dimensions – or ‘supertraits’ - of extaversion/introversion and neuroticism. Eysenck believed that a person’s temperament of extraversion/introversion and neuroticism was genetically determined and was manifested in our physiology, specifically the brain and nervous system. In this he was inspired by Ivan Pavlov. The source of extraversion or introversion was in the varying levels of excitability of the brain; the driver of the neurotic dimension was that an aspect of the nervous system which handled emotional responses to events. · The extravert’s brain is the opposite of what you would expect; it is less excitable than the introvert’s. · Because there is less going on inside, the extravert naturally seeks outside stimulation and contact with others to really feel alive. · The extravert has a more even-handed approach to events with less anguish about how they are perceived. · Extraverts are also generally lively and optimistic, but can be restless risk-takers and unreliable. · The introvert’s brain is more excitable, making a person more vulnerable to moods and having intense inner lives. · As a result of this inner sensory overload, as a form of self-protection they will naturally avoid too much social interaction, which they find mentally taxing. Or, because they have such a rich inner life, they simply do not need a lot of social interaction. · Because they seem to experience things more intensely, introverts have a deeper and more anguished response to life. · They are generally more reserved and serious, pessimistic and can have issues with self-esteem and guilt. This dimension of personality is an indicator of how upset, nervous, worried, anxious or stressed we have a tendency to be. Scoring high on this dimension did not mean you were a neurotic, only that you had the sort of brain that predisposed you to neuroses. A low score would indicate that you are more emotionally stable. The neurotic dimension has a basis in physiology, particularly the autonomic nervous system. What a person naturally does in an emergency, such as panic or stay calm, is a good indicator of where they will be placed on the neurotic dimension. The neurotically-minded over-respond to stimuli, while those who are not are calmer and can put things into perspective. Neurotically-minded introverts, in an effort to control the stimulation that comes into their minds, are susceptible to phobias and panic attacks. Neurotically-minded extraverts tend to undervalue the impact of life events, and may develop neuroses of denial or repression. Later, Eysenck added another dimension, psychoticism. Though it could indicate mental instability, more commonly one's placement within this dimension was an indicator of how much you were likely to be rebellious against the system or wild and reckless. Unlike the extraversion/introversion dimension, which measured sociability, psychoticism measures the extent to which you are a socialized being living according to conventions, or in the extreme an antisocial psychotic or sociopath. Together, the three dimensions of psychoticism-extraversion-neuroticism became known as the PEN model. In a career spanning five decades, fifty books, and more than 900 journal articles, Eysenck shed new light on a number areas. In the 1950s, he made a celebrated attack on the scientific validity of psychoanalysis, stating that there was no evidence at all that it helped to cure patients’ neuroses – and in the process he helped to make psychotherapy more scientifically accountable and focused. Eysenck is also known as an intelligence researcher who, going against the ethos of social conditioning, maintained that intelligence levels were largely heritable and genetic. His 1971 book Race, Intelligence and Education, which laid out evidence of IQ differences according to racial type and was a forerunner of Murray & Hermstein’s The Bell Curve (1994), led to demonstrations and Eysenck’s famously being punched in the face at a university lecture. His research on the subject was partly paid for by the Pioneer Fund, a foundation originally established for eugenics research and to locate differences between the races. Some of his areas of study went beyond the remit of straight psychological science. He delved into astrology, writing a book subtitled ‘Science or superstition?’. Surprisingly, this arch skeptic gave some credibility to the field, noting that planetary position at the time of birth seemed to affect career choice. He also: gave some support to paranormal phenomena; suggested that smoking-related cancer was linked to personality; and presented evidence that some people had a biological disposition to be criminals. Despite such controversies, Eysenck’s overall contribution to psychology is unquestioned. Towards the end of his life, the American Psychological Society made him a William James Fellow for a lifetime of distinguished contribution to psychological science. Then-president Martin Seligman described him as ‘the greatest psychologist of the second half of the twentieth century’. In noting a favorite saying of Eysenck’s that ‘Truth will out’, Seligman remarked that “Time and again the accumulation of facts have vindicated him”. Which of his theories will be vindicated remains to be seen. Though Eysenck’s work on the biological basis of personality has been frequently criticized, it has also increasingly validated by current research. As Steven Pinker notes in The Blank Slate, studies of identical twins raised apart have demonstrated that only a small portion of personality due to socialization. The rest is formed by our genetics. It is important to note that there are many other models of personality type grounded in science – including the commonly used Five Factor model of extraversion, agreeableness, conscientiousness, neuroticism and openness - but Eysenck was the first to make the effort towards a statistical way of understanding the issue. It is unlikely that personality will ever be an exact science, but his work laid a foundation for better understanding of people that did not rely on mere social observation or folk wisdom. As both a serious scientist and a writer of popular psychology books, Eysenck contributed greatly to greater public understanding of psychological issues. He understood that the secrets of personality and intelligence were of too great an interest to all of us to be kept locked behind laboratory doors. “Personality is determined to a large extent by a person’s genes; he is what the accidental arrangement of his parents’ genes produced, and while environment can do something to redress the balance, its influence is severely limited. Personality is in the same boat as intelligence; for both, the genetic influence is overwhelmingly strong, and the role of environment in most cases is reduced to effecting slight changes and perhaps a kind of cover-up”. Born in Germany in 1916, after his parents’ divorce Eysenck was brought up by his grandmother. As a young man he opposed the Nazi regime, and left Germany for good. He settled in England, completing his PhD in psychology at the University of London in 1940. During World War Two he worked at Mill Hill emergency hospital as a psychiatrist, and from 1945-1950 was a psychologist at the Maudsley Hospital. He also established and became director of the psychology department at the University of London’s Institute of Psychiatry, a post he held until 1983. Other books include The Scientific Study of Personality (1952), Sense and Nonsense in Psychology (1956), Know Your Own I.Q. (1962), Crime and Personality (1964), Smoking, Health and Personality (1965), Race, Intelligence and Education (1971, in United States The IQ Argument), Know Your Own Personality (1975) with G. D. Wilson, Astrology – Science or Superstition? (1982) with D. Nias, and Personality, Genetics and Behaviour (1982).